Ministry isn’t always scripted. Christian teachers are often called upon to lead special holiday projects and events without much notice. If the ministry you serve is on a budget, you may find preparing for even well planned Easter projects stressful. Supplying each child with a craft kit is pricy if your ideas are complicated. You need easy, inexpensive crafts that will entertain and reinforce the Easter message. These two Easter craft suggestions could be the good ideas you are looking for. This paper Easter craft is a cinch to complete and prepare for. Here is the supply list you will need: 2 brown construction papers of equal size, a clasp, a hole punch, glue, crayons and a small picture of Jesus for each child to color. The picture should be circular too so you can fit it on the construction paper. Children should color the picture and glue it over one of the squares. Allow the glue to dry for one minute. Lay the second construction paper circle on top of the picture lining them up evenly. Use a hole punch to create a hole at the top of the paper. Slip the clasp in the hole and secure. Children can slide the paper stone away to see Jesus. If you like write “He is Risen” on the front cover of the craft. Busy teachers can reach into their pantries for supplies for most of these Easter crafts. You will need these supplies: toothpicks, white glue, play dough and plastic Easter eggs. Small children will need supervision as some may be tempted to snack on the dough. 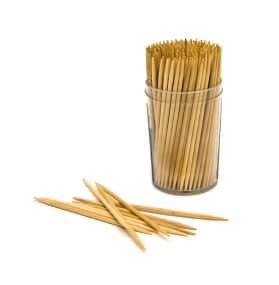 Give each child two toothpicks. Show them how to arrange them like the cross of Jesus. Apply a dot of glue where the two toothpicks join. Allow them to dry while you tell the kids the story of Jesus’ sacrifice on the cross. Open the plastic Easter eggs. Give each child one-half egg to use as a base for the cross. The egg half will remind children of the hill on which the cross stood. Next, children should place a lump of dough on top of the egg. The lump should be thick enough to hold the toothpick cross in place. Position the cross in the center of the dough. Squeeze the dough around the base to secure it in place. This Easter craft will harden and kids will have a neat keepsake to help them remember their Easter story. Easter crafts don’t have to be complicated to be memorable. These easy, simple ideas are fun for kids of all ages. Tony Kummer (Editor) reviewed & updated this page on : March 29, 2011 at 8:46 am. All our content is peer reviewed by our readers, simply leave a comment on any post suggest an update.